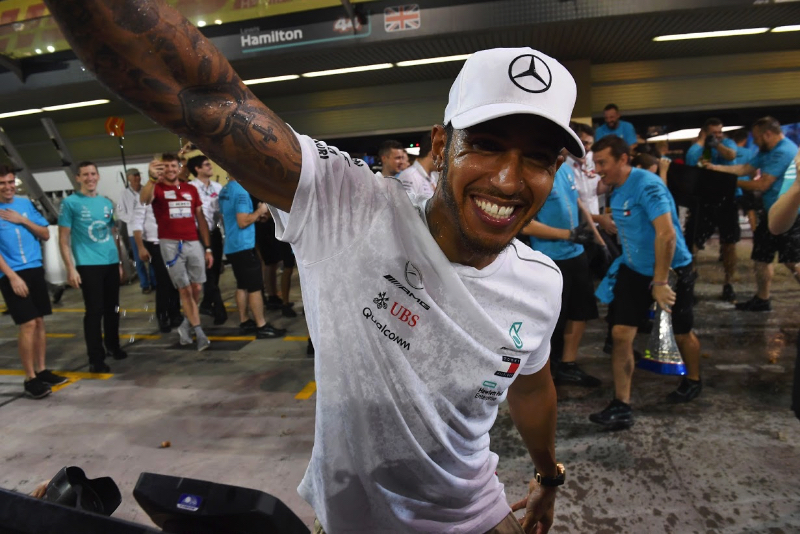 Lewis Hamilton won the Abu Dhabi Grand Prix tonight in his Mercedes, ahead of Sebastian Vettel in his Ferari in second, 2.581 seconds behind, and Max Verstappen in the Red Bull-Renault in third, 12.706 seconds behind the winner. Hamilton takes his 11th win of the season, and his 73rd of his career. Hamilton closes out the drivers' world championship with 408 points, over Vettel with 320 points and Kimi Raikkonen with 251 points. Daniel Ricciardo (15.379s) in his last race at Red Bull finished fourth, followed by Valtteri Bottas (47.947s) in the second Mercedes was fifth, Carlos Sainz (22.548s) in the Renault was sixth, Charles Leclerc (90.789s) in the Sauber-Ferrari was seventh, Sergio Perez (91.275) in the Force India-Mercedes was eighth, Romain Grosjean (1 lap) in the Haas-Ferrari was ninth, and his team mate Kevin Magnussen was in the final points paying position in tenth. Before the start, Hamilton sat on pole, with his Mercedes team mate alongside on the front row, the Ferraris of Vettel and Raikkonen on row two, the Red Bulls of Ricciardo and Verstappen on row three, Grosjean and Leclerc on row four and Ocon and Nico Hulkenberg rounding out the top ten. The first five starting on ultrasoft tyres, five through ten on hypersoft tyres, the rest on a combination of ultrasoft and supersoft tyres. The forecasters predicting a 40% chance of showers. As the sun goes down, the drivers came around on their formation lap, the lights went out and the race began with Hamilton taking the lead ahead of Bottas, Vettel, Raikkonen, Leclerc and Ricciardo - Verstappen down to tenth. Midway through the first lap Hulkenberg and Grosjean touch wheels, causing the Renault to roll and winds up upside-down - the safety car is deployed. Brendon Hartley pits and switches to ultrasoft tyres. The marshals turn Hulkenberg's car right-sid-up and Hulkenberg gets out and is okay. Under the safetycar Hamilton leads Bottas, Vettel, Raikkonen, Leclerc, Ricciardo, Grosjean, Esteban Ocon, Verstappen and Perez in tenth. At the end of lap four the safetycar comes in and the race resumes with Hamilton getting a good jump on the rest. On lap 5 Verstappen passes Ocon, but Ocon comes back and passes Verstappen - Perez getting Verstappen as well. Verstappen complains that his engine bogged down. On lap 5 Hamilton sets fast lap at 1m43.982s. On lap 6 Verstappen and Ocon battle and Verrstappen chops by Ocon and the two bang wheels. On lap 7 Raikkonen comes to a stop just after the start-finish line. The virtual safety car comes out. Hamilton, Leclerc and Grosjean pit. Hamilton switches to supersoft tyres, and rejoins in fifth possibly able to go to the finish, Leclerc in 14th on supersoft tyres. Bottas leads Vettel, Ricciardo, Verstappen, Hamilton, Ocon, Perez, Marcus Ericsson, Sainz and Pierre Gasly in tenth. The virtual saftety car ends on lap 9 and the race resumes with Bottas leading Vettel and Ricciardo. Hamilton passes Verstappen, but Verstappen comes back and repasses Hamlton for fourth. On lap 9 Ricciardo sets fast lap at 1m43.861s. Ricciardo and Verstappen are lapping quicker than Bottas and Vettel and are closing in. Sainz is closing in on Ericsson in eighth and the two battle on lap 13. On lap 14 Sainz takes eighth from Ericsson. On lap 15 Vettel pits from second place and switches to supersoft tyres and rejoins sixth behind Ocon. Vettel passes Ocon right away for fifth. On lap 16 Bottas pits from the lead and switches to supersoft tyres and rejoins in fourth behind Hamilton and ahead of Vettel. Ricciardo takes the lead. On lap 17 Vettel sets fast lap 1m43.602s. Verstappen pits for supersoft tyres and rejoins in fifth. On lap 18 Bottas sets fast lap at 1m43.095s. On lap 19 Ocon pits and switches to supersoft tyres and rejoins in 18th. At lap 20 Ricciardo leads Hamilton by 6.0 seconds, followed by Bottas (14.0s), Vettel (17.6s), Verstappen (19.5s), Perez (32.5s), Sainz (36.0s), Ericsson (41.2s), Gasly (43.9s) and Fernando Alonso (44.8s) in tenth place - places six through ten yet to pit. Teams speculating that their might be some rain showers coming. On lap 23 Ocon coming back after his pit stop passes Sergey Sirotkin for 16th. Spots of rain have started falling. Verstappen reports that it is raining on the back straight. On lap 25 Hartley passes Sirotkin for 16th. Ericsson slows and puls off the track saying the car has no power. On lap 26 Leclerc passes Alonso for ninth. On lap 27 Perez pits for supersoft tyres amd rejoins in 11th. On lap 28 Alonso pits for supersoft tyres and rejoins in 17th. Hamilton tells Mercedes "my tyres definatley don't feel great." On lap 29 Vettel sets fast lap at 1m32.017s. Gasly pits for ultrasoft tyres and rejoins in 16th. On lap 30 Verstappen sets fast lap at 1m43.000s. At lap 30 Riccardo leads Hamilton by 2.4 seconds, followed by Bottas (9.2s), Vettel (10.6s), Verstappen (12.5s), Sainz (42.6s), Leclerc (62.6s), Perez (64.6s), Magnussen (69.2s) and Stroll (74.3s) in tenth place. Ocon and Vandoorne battling - Ocon passes for 11th place. On lap 32 Bottas sets fast lap at 1m32.975s. Alonso passes Sirotkin for 16th. On lap 33 Ricciardo pits from the lead for supersoft tyres and rejoins in fifth place. Hamilton retakes the lead, ahead of Bottas and Vettel. On lap 35 Gasly passes Vandoorne, but Vandoorne gets back the spot. Bottas locks up and runs wide, and Vettel takes advantage and passes the Finn for second place. On lap 35 Ricciardo sets fast lap at 1m41.249s. Bottas locks up again and Verstappen closes in on him. Ricciardo closes on Verstappen. On lap 36 Sainz pirs from sixth for supersoft tyres. On lap 38 Verstappen dives on the inside of Bottas at turn 13, the two touching, and Verappten passes for third. The next lap Ricciardo passes Bottas for fourth. At lap 40 Hamilton leads Vettel by 5.8 seconds, followed by Verstappen (10.2s), Ricciardo (12.2s), Bottas (16.7s), Sainz (65.3s), Leclerc (71.8s), Perez (74.7s), Magnussen (82.2s) and Ocon (88.4s) in tenth place. On lap 41 Bottas pits fo ultrasoft tyres and rejoins still fifth. The team tells him that they pitted because they saw a problem with the right-rear after the contact with Verstappen. On lap 42 Lance Stroll pits for ultrasoft tyres and rejoins in 15th. On lap 43 Bottas sets fast lap at 1m40.953s. On lap 47 Ocon looses power and pulls off the track. On lap 48 Gasly's Toro Rosso, in tenth place, is smoking and pulls off the track and retires. At lap 50 Hamilton leads Vettel by 4.3 seconds, followed by Verstappen (8.4s), Ricciardo (10.7s), Bottas (36.5s), Sainz (69.0s), Leclerc (81.9s), Perez (84.1s), Grosjean (1 lap) and Magnussen in tenth place. McLaren urges on Alonso to try to take tenth place. On lap 53 Perez closes in on Leclerc in seventh. Alonso is handed a 15-second time-penalty for cutting corners. On lap 54 Vettel sets fast lap at 1m40.867s. Hamilton gets the chequered flag, actor Will Smith waving the flag, to finish off the season with his eleven victory of the year ahead of Vettel and Verstappen. A number of drivers perform dougnuts after the chequered flag.